1. Mix lime juice, oil, onion, vinegar, honey and salt in a medium bowl. 2. 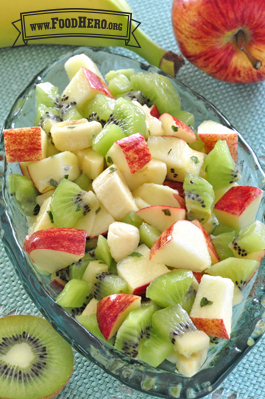 Chop kiwis, banana and apple into small cubes. 3. Add fruit and mint (if using) to the dressing; toss to coat. Honey is not recommended for children under 1 year old. Try brown sugar.